I haven’t posted in a while about my Friday drawing time downtown France Kernersville…but I’ve sure been drawing there and have been enjoying the company of other “sketchy” folks at the Factory. I have a backlog of drawings to post. Here’s one from a while ago, before the heat kicked up. Somehow, staying at the Factory this summer has been cooler than venturing out into town to draw. This is probably due to the courtyard at the Factory being surrounded by the tall walls of the building, thus offering much needed shade. 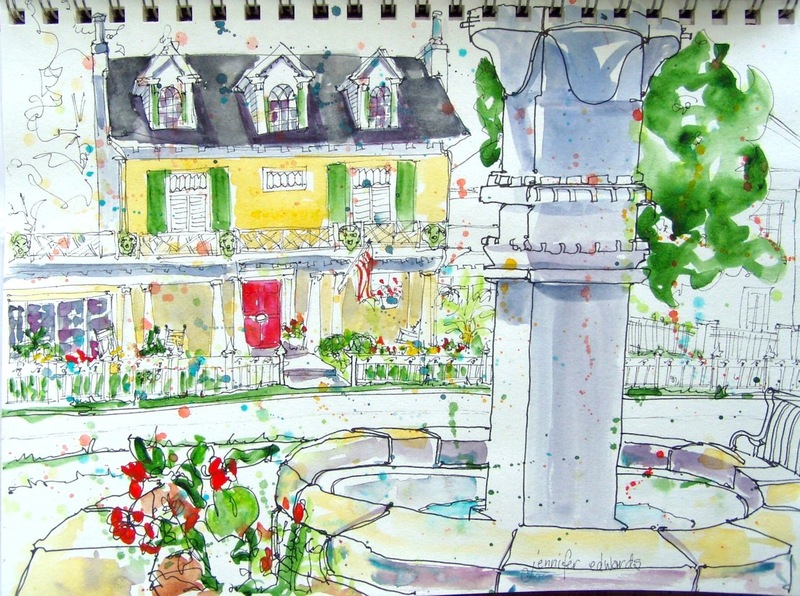 This drawing is of our Harmon House from the viewpoint at Harmon Park across the street. There’s a lovely fountain (on this day it was waterless) with a gazebo (that drawing I’ll show you soon) and playground, large field and picnic shelter area. Perfect for sketching, when it’s not so stinkin’ hot! I wish I knew more about the Harmon House other than it is our community event center. It can be rented out for weddings and receptions…a beautiful place for fancy doings. Do click on the highlighted words there…you’ll see some beautiful views of the house up close and around the sides and back. The historic homes in our town are truly lovely and this one leads the way with all its gorgeous windows, balconies, and white picket fence. Your drawings are so cheerfully colorful. I enjoyed reading about your experience associated with the drawing–thank you! Hello Jennifer. You know, no matter what mood I’m in, seeing one of your posts/paintings always puts a smile on my face. This is a very cute sketch!